Following her stunning victory, Mary is approached by her former entourage, who offer a half-hearted apology…that she accepts, and things are back to the way they were before she became a Miké. She doesn’t seem to hold a grudge for how they treated her; written or unwritten, they abided by the rules and traditions of the school with regard to treatment of livestock. But they also revealed something about the school’s enrollment: one need not be in debt to be livestock. These three girls aren’t technically Mikés, but they are another kind of livestock: they never lead; they only follow, even unto the slaughterhouse. 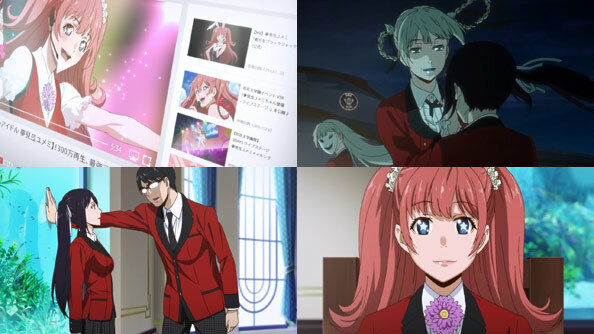 No one truly knows why Yumeko maintains her Miké status, but it’s assumed its so she can challenge the council to another offical match, and it’s assumed the one she wants to gamble with the most is the president, Momobami Kirari. 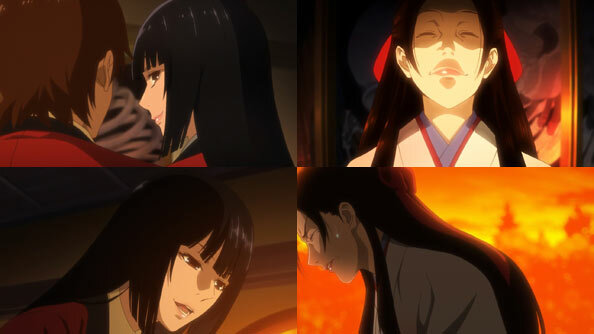 But she doesn’t get Momobami; not this time. Instead, she’s intercepted and arrested by the council member she’ll have to play with first in order to get to Momobami; Beautification Committee chairman (and noted gun nut and lunatic) Ikishima Midari. 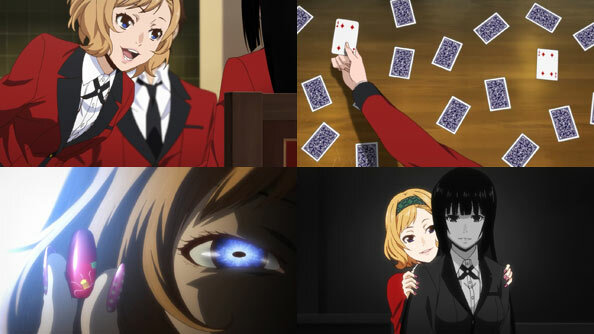 Midari has her stylish gal-goons take Yumeko (and Ryouta) to a dank interrogation chamber in the bowels of the school, where they’ll play an “ESP card game” in which they guess which cards will be drawn in the adjacent room. Each correct guess means a point, and the person with the most points gets to fire one of two .357 Magnum revolvers loaded with anywhere from zero to six bullets. 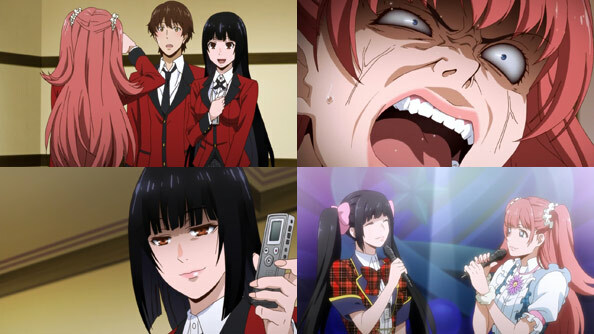 Knowing what we know about Midari, it’s a very Midari game (what with the large amount of pure chance involved), and if Yumeko is worried, she doesn’t let on, keeping her calm, cool face throughout. 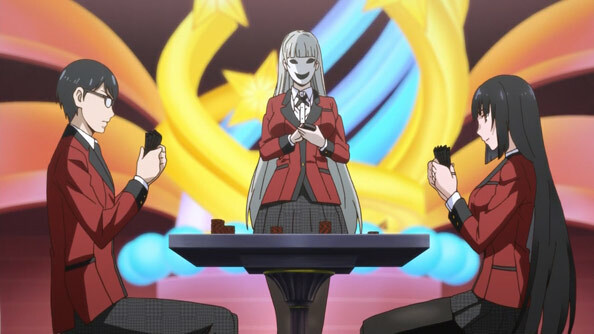 However, Midari also sees in Yumeko a slightly more buttoned-up version of herself: a pervert who gets off on gambling to fulfill her appetites. 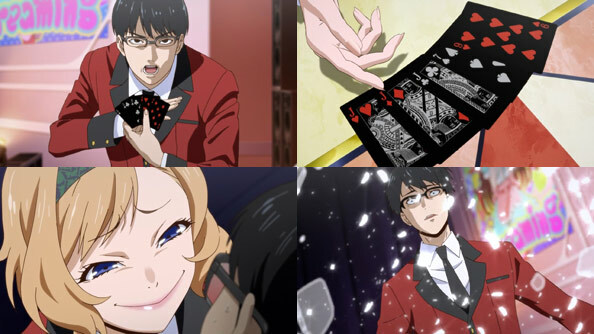 Making Ryouta deal the cards that he believes will determine the fate of two women is a great exercise to toughen him up (or just make him a nervous wreck), while Midari agrees that if she loses, she’ll pay Yumeko a cool billion yen ($9 million). Following a fairly routine pattern in this show, Yumeko loses the first of three rounds by one point, giving Midari the first shot. Since she fully loaded her pistol, Midari has at least a 50-50 chance of shooting her. 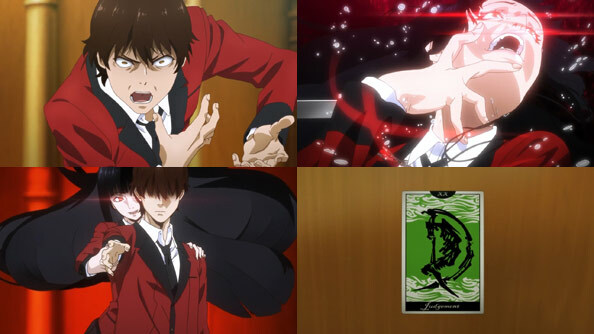 If Yumeko loaded any bullets into hers, the odds are better. 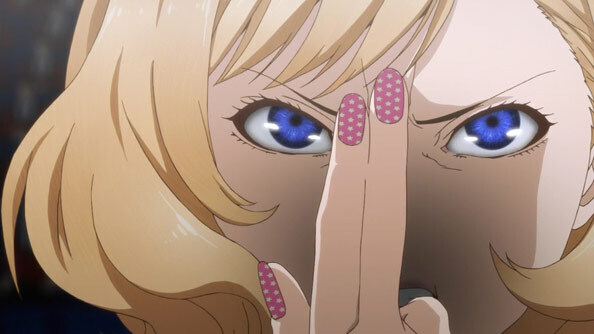 Of course, either of the guns could backfire, which could be why Yumeko warns Midari not to fire when the time comes. 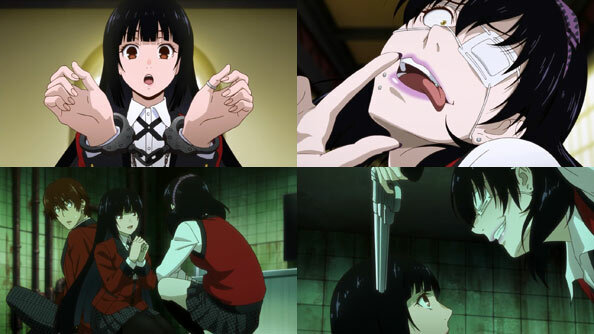 Yumeko always seems to gamble like her life (and certainly her enjoyment) is on the line, so as theatrical and wild as Midari is, this is simply a more raw and concentrated version of the feeling Yumeko craves. I forsee both parties coming away from this not only alive, but…satisfied. As for Mary, she’s the one intercepted by President Momobami, who doesn’t mince words over tea: she wants Mary to join the council. Clearly, she sees potential in her. Mary may not be as nuts as Yumeko, but she’s definitely going places. 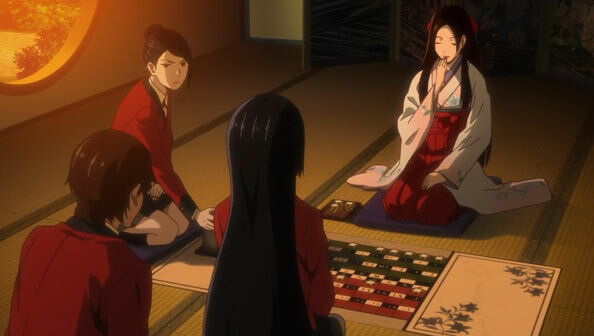 Upon watching the “official match” between Mary and porcelain-faced council member Nishinotouin Yuriko, Yumeko becomes excited at the prospect of the chouhan bakuchi style game they play, in which swords are used rather than dice, and how they land determines the distribution of chips to a wild extent. 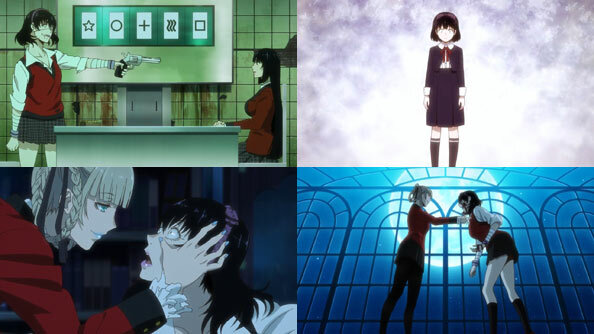 It’s not a gamble for the weary, but as Yumeko is a compulsive gambler, it’s perfect. 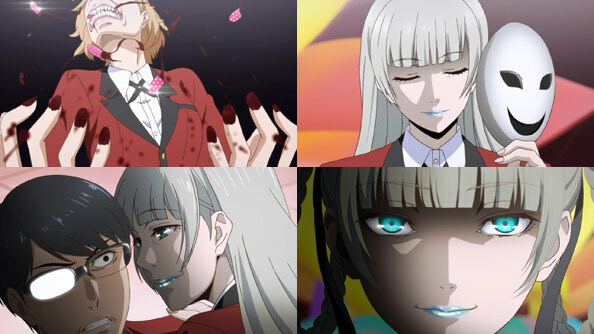 However, if I didn’t know better, I’d say there was more to her facing off against Yuriko than simply wanting to play or win, and that gets back to Saotome’s humiliating, devastating loss to Yuriko in the episode’s opening moments. 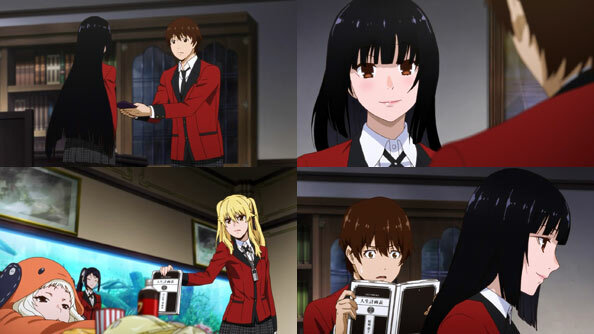 This is Yumeko exercising psychological warfare on a highly accomplished and studied opponent—and largely succeeding. And while there is a practical purpose for getting Yuriko riled up, I don’t doubt Yumeko also takes satisfaction in putting Yuriko in her place, suggesting she won’t let people like her have their way with livestock unchallenged. 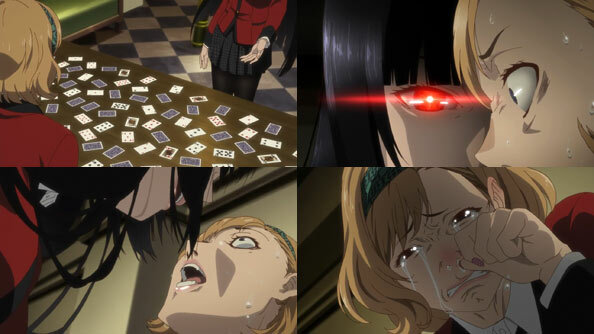 Add to that the fact that, naturally, Yumeko’s opponent is cheating (with the dealer using magnets to manipulate one—but only one—of the metal swords), and it looks like this gamble will take the same shape as the previous two, with Yumeko prevailing at the last second and Yuriko’s mask finally cracking and breaking. However, we get a different outcome, and notably no overt “gamblingasm”. 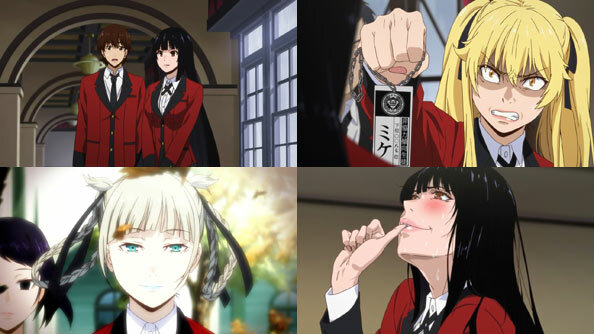 Instead, Council President Momobami enters with two other council members, to oversee the result of the sword toss, which is something neither Yumeko or Yuriko expected, and puts Yumeko 310 million yen (over $2 million) in debt to Yuriko. 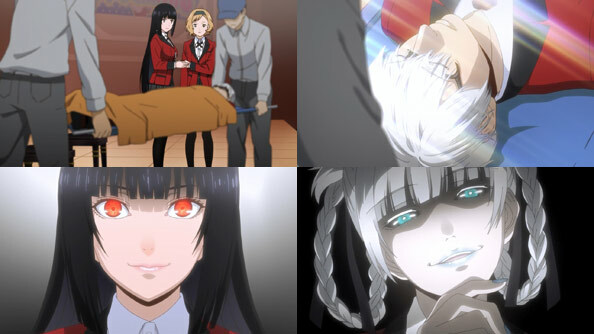 Momobami’s presents makes Yumeko suspect she was not only the victim of magnets, but a “badger”, and that this was a multifaceted cheat that may have required the ignorance of both players. Yuriko may have won, but she certainly doesn’t look or seem to feel like she won. Meanwhile, despite her immense new debt, all Yumeko is focused on is facing off against Momobami, which is her right as newly-minted livestock. 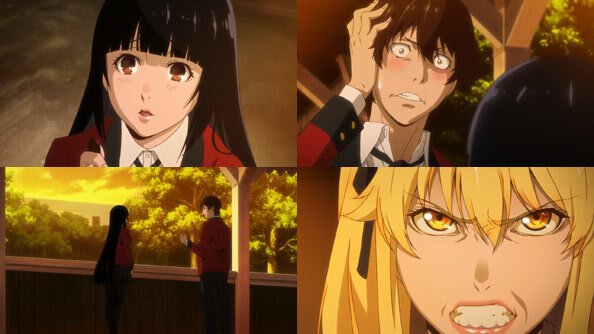 As for the hazing and bullying that results from her initiation into the livestock, it runs off Yumeko like rain from a fireman’s hat; when they call her the common cat name “Mike”, she simply gets on her knees and starts talking and washing herself like a cat, completely immune to the students barbs and, on the contrary, scaring them off with her bizarre antics. Here’s hoping this is a preamble to Yumeko becoming an inspiration to all livestock. Yumeko considers Ryouta a friend—even to the point of first-name terms—but he doesn’t seem like her romantic interest. At the moment, that seems to be gambling itself, with only the highest of risks giving her any kind of pleasure. But the OP strongly suggests a very close relationship to come with the yuki-onna-looking student council president, Momobari Kirari. 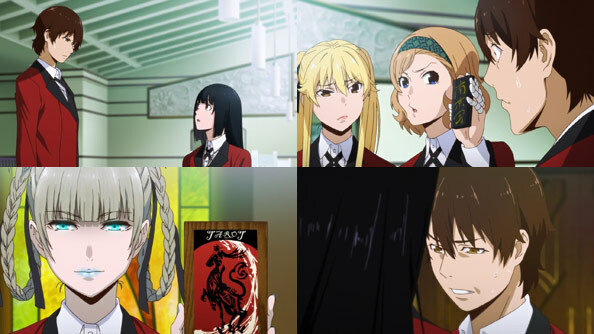 In a bit of necessary exposition, Ryouta tells Yumeko that ever since Mombari rose to power (winning her position from the predecessor with gambling, natch) the bullying of the “livestock”—the 100 or so students with the least luck and hence most debt—has intensified exponentially. Thanks to Yumeko’s gift, Ryouta is no longer a “Fido”, but after her defeat Mary is a “Lassie”, and doesn’t take to it well. 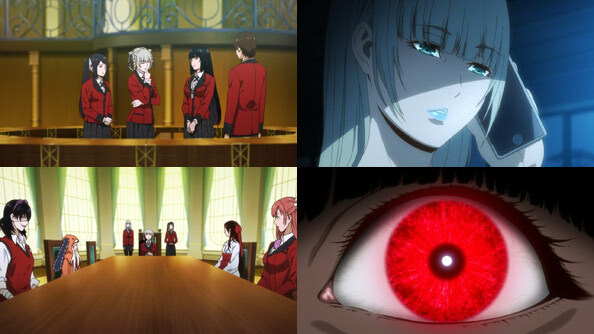 But Yumeko has little time to concern herself with those she’s already beaten; she seeks a stronger opponent, and this week they come to her: the youngest member of the council, first-year Sumeragi Itsuki, daughter of a multi-billion-yen toy company CEO. 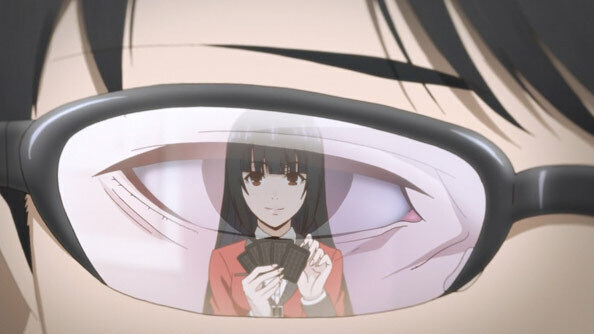 Itsuki challenges Yumeko to a game of “Double Card Memory” involving two freshly-opened decks of cards provided by Itsuki and—as I figured—also manufactured by her dad’s company so that she can cheat people. For the second straight week, it would appear that those at the top of the pile at Hyakkaou Academy aren’t there by playing by the rules or even being exceptionally lucky—it’s more a matter of creating a way to make your own luck. In the case of Sumeragi Itsuki, she uses a tiny part of the back-of-card design to let her know which deck is which on the table. 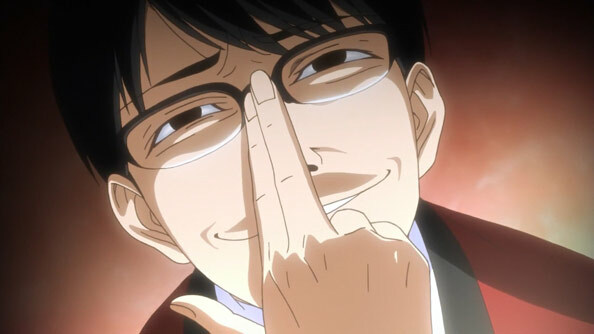 Once she beats Yumeko in the first match—winning the 20 million she fronted Yumeko—Yumeko tearfully begs her for a rematch, even agreeing to go along with what Itsuki wants Yumeko to front: her fingernails and toenails, which Itsuki obsessively collects and decorates. Ew! 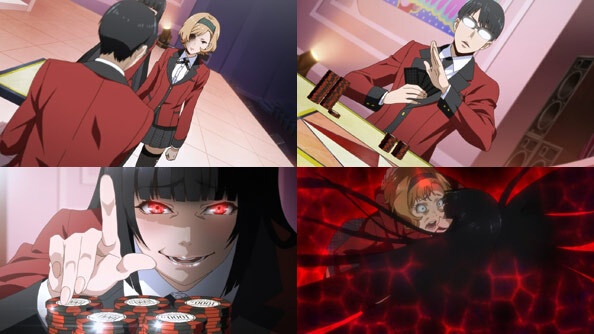 Unfortunately for the freshman, Yumeko not only has exceptional memory, but saw through her trump, and never gives her an opportunity to flip a single card in the rematch. 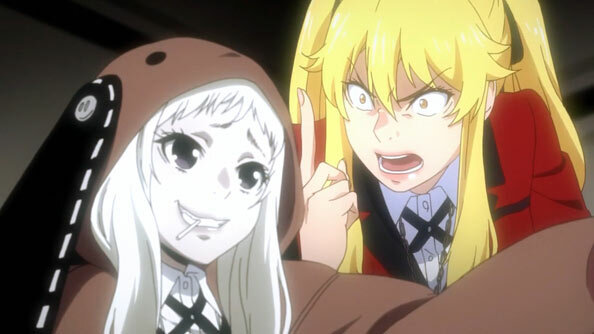 It’s only when Itsuka goes a bit mad that Yumeko gladly joins in the madness. And when she recommends Itsuka wager her nails, it reduces her opponent to big soppy tears. 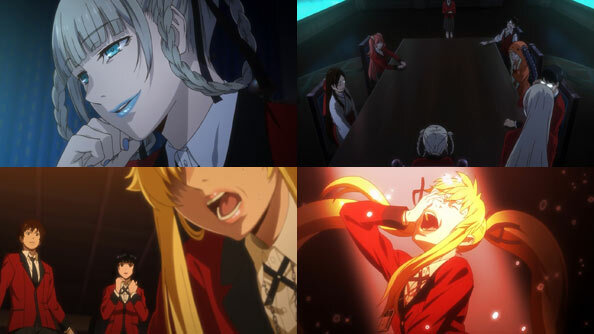 Yumeko responds to the shameless display with disgust; after a second “gamblinggasm”, Yumeko has been made officially “bored” by the simpering Itsuka. On to the next victi-er, opponent. 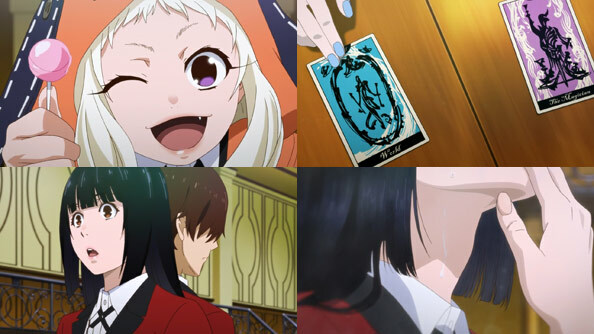 President Momobari quickly hears of Sumeragi’s defeat and Yumeko’s quick rise, and instructs the rest of the (very eccentric) student council to start “meddling in her affairs,” clearly intrigued by this newcomer and eager to test the limits of her prowess—if they indeed exist! Ryouta accompanies Yumeko to the after-hours games at the traditional culture research club, and come upon yet another pathetic scene: Saotome Mary digging her debt-hole over 49 million yen deeper. 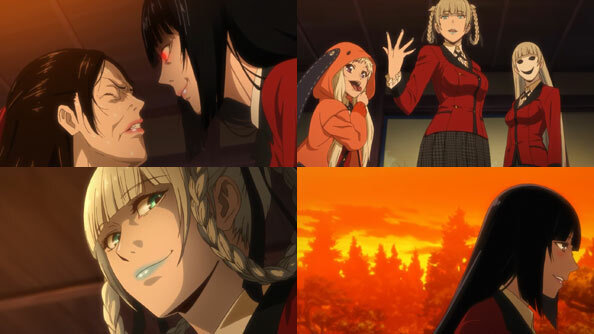 I wonder if this will be an ongoing thing with Mary losing more and more, or if Yumeko will find it in her heart to save her first victim the same way she saved Ryouta, who was only ever nice to her. 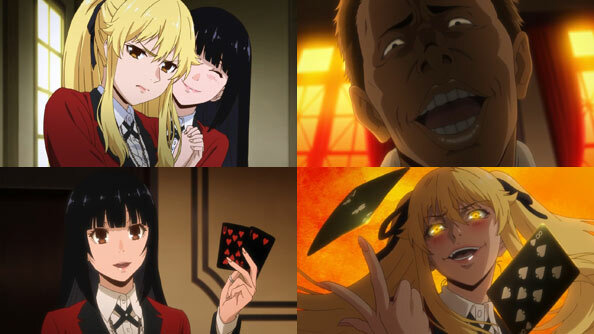 In any case, I’m enjoying the friendliness and politeness with which students challenge one another, a facade which gradually devolves into face-contorting madness, over-the-top posturing and yelling, and the aforementioned “gamblinggasms.” Kakegurui can be thick on the explaining, but is generally just flat-out fun.